Laughing Bird shrimp are unlike many farmed shrimp, and that is a good thing. They are raised in the Caribbean, in inland ponds on the coast of Belize. They swim in filtered sea water, are fed a vegetarian diet, are not treated with additives or sulfites and are sold fresh and hand-peeled. The farm, the only one in Belize, has been given positive marks by the World Wildlife Fund. 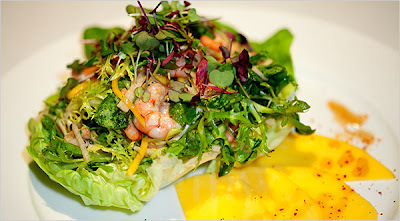 Aficionados of the small, sweet shrimp in restaurant kitchens include Larry Forgione at the Monkey Bar, whose tropical shrimp salad, below, sparkles with mango, cucumber, jicama, pineapple, ginger, mint, cilantro and a splash of rum. Laughing Bird shrimp are $12.99 a pound atfreshdirect.com, $13.95 a pound at Lobster Place at Chelsea Market and in Greenwich Village.